We are proud to offer an outstanding 'outside catering service' at a very reasonable cost . 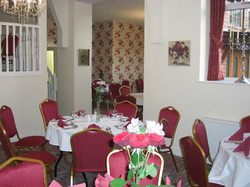 Or you may prefer to book our own Milnes Gaskell Catering Suite in Thornes, Wakefield at no extra charge. Our beautifully decorated and furnished suite seats up to 50 guests. All food is prepared in our own hygienically approved kitchens and brought to you freshly prepared. We have 3 menu's available from a Traditional Buffet to Sit down meal. Please telephone or email for our brochure or for a written estimate. Any inspection of our facilities welcome at anytime. We are based in the Wakefield area and cater for the whole of Yorkshire.